An Anemone in my Elbow: PVNWHAT?! "What did you say it was called?" I couldn't tell you the amount of times the above exchange has taken place over the past 2 and a half months, since I was diagnosed with PVNS - Pigmented Villonodular Synovitis - in my left elbow. Although to be honest it's not surprising - up until July 11th this year my reaction would have been the same. Pigmented Villonodular Synovitis - PVNS for short - is a benign proliferative disorder of the joint which affects the synovium (lining of the joint), bursae, and/or tendon sheaths. It causes the synovium to overgrow within the affected joint, forming nodules - in other words, tumour. The condition can either be nodular or diffuse. The nodular form is less common presents as a single mass within the joint. 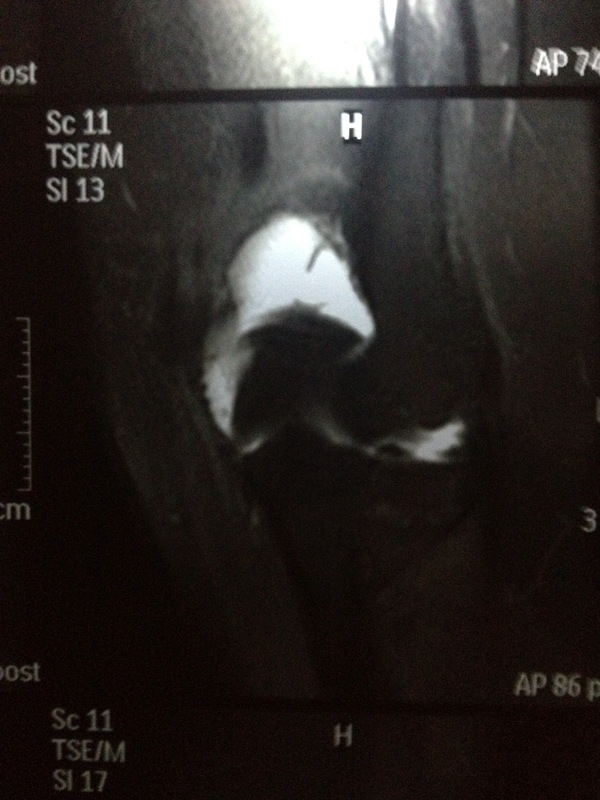 Diffuse PVNS affects the entire synovium of the joint, and is harder to treat. Rather than being one solid mass, diffuse PVNS spreads haemosiderin stained villi - 'tentacle' like fronds of tumour tissue - throughout the joint. There is no clear cause, and no known cure. The tumour can be treated with surgery, however unless EVERY single cell is removed, the rate of recurrence is above 50%. Chemotherapy and radiotherapy treatments are also being trialled around the world in an attempt to find a way to eradicate this rare disease - so rare that it affects approximately 1.8 people in every million. My story starts 4 years ago. I can remember as clearly as ever - I was at work, it was a Monday morning about 11am, and I noticed my right arm was a bit stiff, and painful in my elbow. 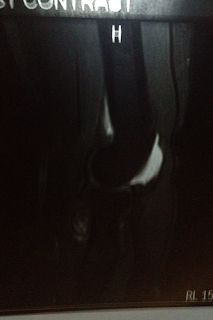 Over the next 24 hours my joint became swollen, warm to touch, and my range of movement significantly reduced. After 2 days I showed it to the pharmacist who said it was probably just some inflammation that would go away with Neurofen. So I took that regularly for a few days and by the weekend my arm was completely back to normal. A few weeks later I mentioned it to my GP while I was there picking up a prescription and he sent me for an X-Ray which was all clear. He suggested that maybe I had pulled my elbow carrying something heavy. At the time I was living on the third story of a building with no elevators, and had carried my groceries upstairs the day before my elbow had swelled. It made sense, so I put it out of my head. Fast forward two years. It was the day of Kate and Will's Royal Wedding. 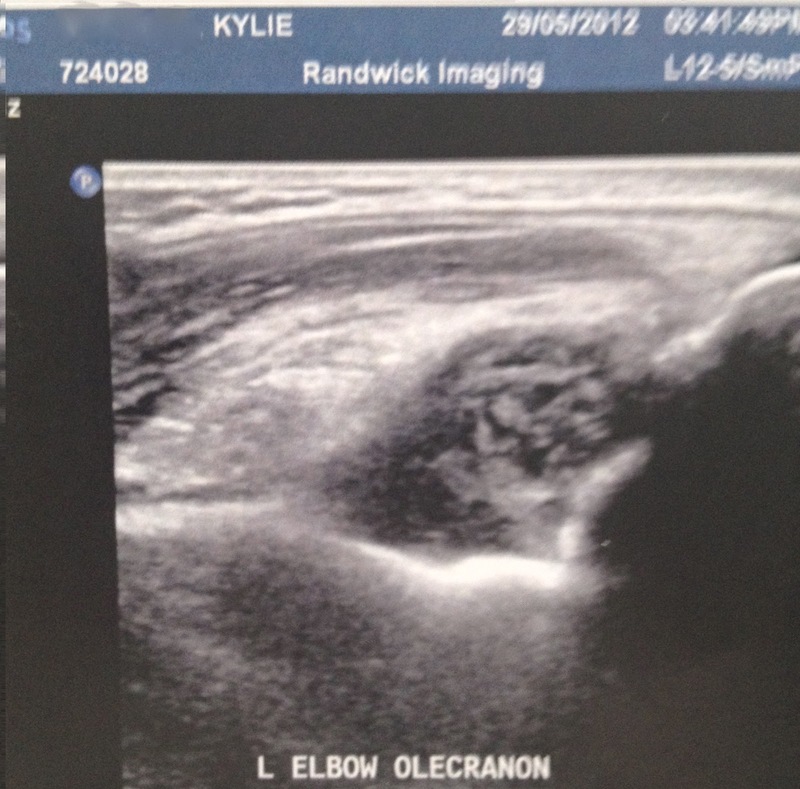 I had noticed a twinge in my elbow the night before, and by lunch time my elbow was warm, swollen, sore and stiff. That night I slept at my best friends house - we watched the Royal Wedding together and I was in agony the whole night. We Googled my symptoms and came to the conclusion of Bursitis. I started taking Neurofen again and within the week, my symptoms had resolved. Once again, I mentioned it to my GP (a different doctor this time) and she said it sounded like classic Bursitis. She wasn't concerned so neither was I. I put it out of my head. In March of this year I had a short episode of pain and swelling that lasted just two days before it completely resolved. I put it out of my head. It was in late May/early June of this year that things got serious. I had just turned 25 and was playing a minor lead role in a musical production of Crazy for You for which I had been rehearsing twice a week for 4 months, as well as working full time. Production Week was hectic and exhausting, but SO much fun and the whole cast was so sad when it was over that we jumped at the chance to get together the following weekend to celebrate one of the girls birthdays. As the night wore on, I noticed a familiar pain beginning to brew in my elbow. Driving 2 hours home after the party I was extremely uncomfortable and by the next morning my elbow was the size of a mango, hot to touch, and completely stiff. After struggling through work I went straight to my GP who took one look at my arm, prescribed a strong non-steroidal anti-inflammatory, and wrote an order for an ultrasound the following day. That night was the worst night of my life. 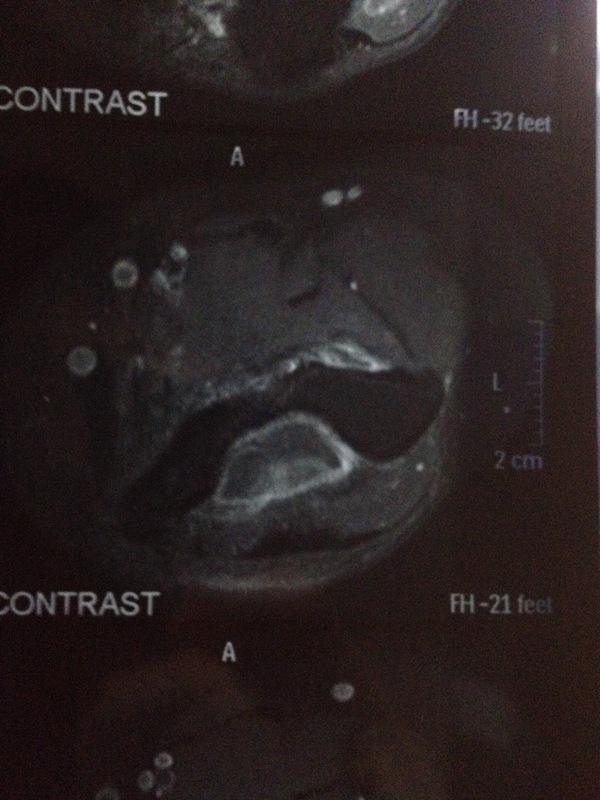 At the time I didn't know it, but my ulna nerve had been compressed. White-hot pain was shooting up and down my arm, no position I laid in in bed was comfortable, and nothing I did could ease the intense, spasming pain I was in. My fingers were numb, my arm felt like it was about to explode, and I could hardly breathe for pain. I called my mum after midnight, hyperventilating and in tears - she wanted me to go to Emergency but I was in so much pain I couldn't even move. I eventually forced myself into a broken sleep, but when I woke up the next morning the pain was no better. I (stupidly) dragged myself to work where I could do nothing but cry every time I moved my arm a single millimetre. Finally, 3pm rolled around and I left work for my ultrasound. The technician felt so bad for me - I have a very high tolerance to pain, but I was in so much agony that tears rolled down my face and I sobbed as he moved the ultrasound over my elbow. Then came the words "I don't want you to panic....but I just need to get a doctor to come and look at this." I was in too much pain to care, I just wanted to get home so I could take some pain killers and sleep. The second doctor came into the room to have a look at the screen and told me that I needed to take the pictures straight to the doctor and they would fax the report over. It turned out the doctor was booked out as it was almost 5pm by this point, but he fitted me in for the next morning. I took the day off work and went to collect the results, which showed a moderate sized complex joint effusion. What baffled the doctor most was that the fluid looked like it might be blood, however he wasn't keen to aspirate before we had a clearer idea of what was going on. He referred me to a Rheumatologist as he was concerned I had Rheumatoid Arthritis. A fortnight later I had my appointment with the Rheumatologist who examined me, listened to my symptoms carefully, and decided almost immediately that I did NOT have Rheumatoid Arthritis. He mentioned a few possible diagnosis' and amongst them was what he described as a 'sea anemone-like tumour' called PVNS which mimics the symptoms of RA, but only affects one joint . He said he didn't know much about it and it was so rare that it was unlikely, but he'd send me for an MRI anyhow. I was so certain that everything would turn out to be nothing that I couldn't even remember the letters PVNS...it wasn't until a few days later that I finally remembered the correct letters so I could look it up and when I did I was shocked - every website described my condition to a tee. Still, I wasn't overly concerned - I hardly ever get sick, I rarely even get colds or the flu, so how could I have a life changing tumour?! 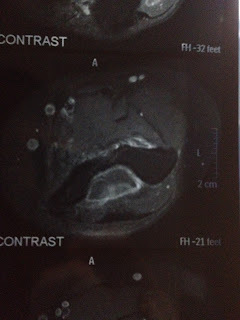 My MRI appointment rolled around and was one of the most painful hours I've experienced - my arm (which still hadn't gained full ROM since my swelling attack a month earlier) had to be weighted down with sandbags to hold it straight for the entire hour, causing severe nerve spasms. I laid in the machine with tears rolling down my face, trying to use my imagination to take me away from the pain. 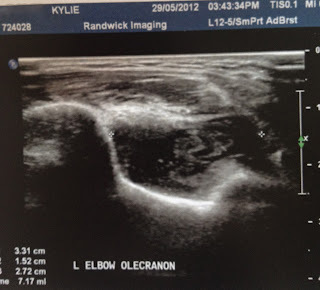 Once the scan was done I put it out of my mind and got on with things. I was so unconcerned about the results that I told my mum not to even worry about coming with me to my appointment with the Rheumatologist to get the scans back. My best friend was on holiday with her family in Asia and I hadn't even bothered to mention I was going back to the doctor! I almost fell off the chair when he asked me to sit and told me it looked like I had a complicated tumour throughout my entire elbow. Everything happened very fast from there. I met my orthopaedic surgeon the following day, who admitted that he didn't know a lot about PVNS either but he had read about it and studied it at journal club and was quite confident he could get a good amount safely out, at least enough to biopsy and relieve some of my symptoms. He did tell me up front that I had a large amount of Median and Ulna nerve involvement, and also ligament involvement, so he wouldn't be able to remove it all as he didn't want to risk damaging my arm or destroying my nerves. He said that this had a high rate of recurrence even if all the tumour is removed during surgery and seeing as he would be leaving at least 1/3 of mine behind that I should prepare myself for a long road ahead. 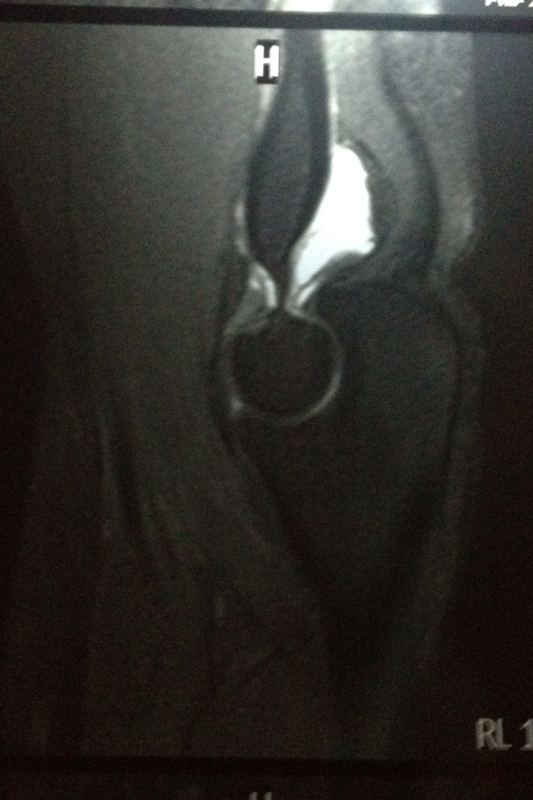 He booked an arthroscopic synovectomy and biopsy for August 28th and I left the appointment in tears of shock. My best friend called me from the merry-go-round line at Universal Studio's in Singapore and we both cried. I spent the weeks leading up to surgery reading and researching and exercising and preparing myself as much as I could both mentally and physically. The thing that I found the hardest to deal with was the lack of control - I am the first to admit that I am a control freak, and I also am a stickler for routine. I like to know where I'm going, what I'm doing, who with, and at what time. Knowing that I had a tumour in my arm and that I was going to have surgery, but no one being able to tell me what was going to happen from there, or what I'd need to do was a huge struggle. There were many teary late night phone calls with my mum and my best friend in the weeks between diagnosis and surgery. Surgery day rolled around and the procedure went off without a hitch. I was first on the list at 8am - I think my surgeon was a bit excited as he had never done a PVNS surgery before - and it lasted about an hour and a half. I was given a nerve block in the anaesthetic bay, so when I woke up I had no feeling from my shoulder down - it was the weirdest thing I have ever experienced! As much as I could make my brain tell my fingers to move, nothing would happen! It was a good thing, though, as it meant that I had absolutely NO post-surgical pain. I slept on and off for about 6 or 7 hours once I was back on the ward, then my sister and best friend came to visit (with chocolate!). Even when they went home about 7.30pm, followed by mum and dad about an hour later, I still had no feeling in my arm or hand - it didn't start to come back until about 10.30pm that night, and once I started getting the first tingles the nurses dosed me with Endone - I can't speak highly enough of the care and pain management I received. My surgeon came by around 6pm when my parents, sister, and best friend were all with me and let us know that the surgery went as well as it could have - he didn't get all the tumour but he was happy with what he got. He had sent several biopsies of the rust coloured tissue off for histopathology...as soon as I heard the words 'rust coloured' my heart sank. Tissue stained with haemosiderin - giving it a rust colour - is one of the most typical features of PVNS. The next morning my surgeon came back again and cleared me for discharge. Over the course of the morning I had my first physio session (during which I got extremely dizzy and vomited) and then had my dressings changed (during which I got extremely dizzy and vomited). Around 1.30pm - once I was dosed with Ondansetron, Endone, Panadol and Voltaren - I was good to go. That was three and a half weeks ago, and brings me to now. Over the past three and a half weeks I have been brave and strong, and I have also been weak and miserable. My diagnosis of Diffuse PVNS was confirmed on histopathology, news which was given to me when I saw my surgeon for my 2 week post-op appointment. 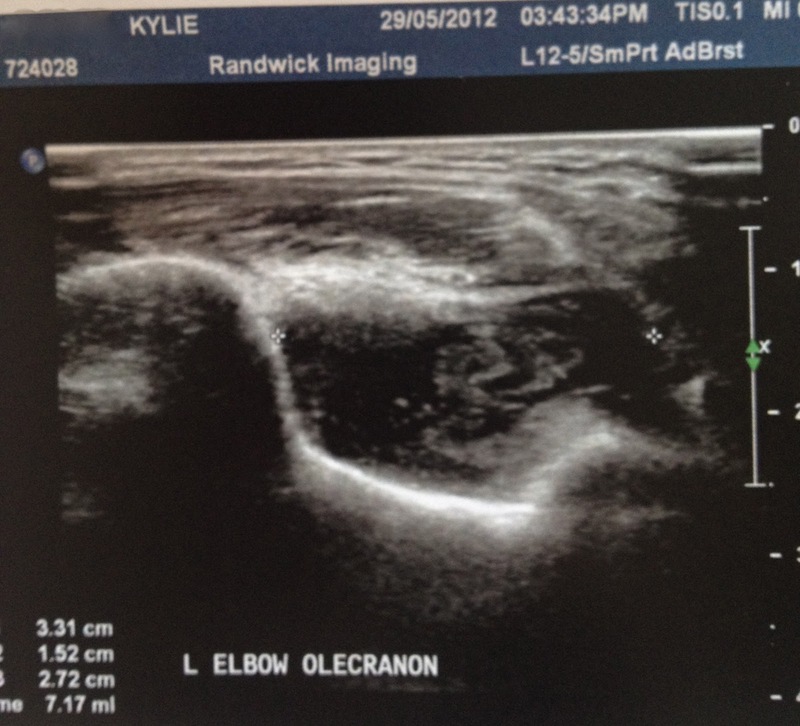 My pain post surgery was surprisingly small - my stitches bothered me more than my elbow did! Up until yesterday I had been undergoing intense daily physiotherapy to restore my ROM, but from now on I only have to do the exercises at home myself (woohoo!). I've also had a consultation with an Oncologist who is going to be working with my surgeon to come up with the best care plan possible for me to reduce (or clear!) the remaining tumour. So far the plan is to watch and wait for the next 10-12 weeks, and then enrol me on an Imatinib study in December, when I am well enough to undergo baseline testing. I've been back at work this week, and although exhausting, it has been good for me to get back into a routine. I've started having some tingling in my thumb, index finger and middle finger, which the physio and oncologist feel is coming from my median nerve, which is a known site of remaining tumour. A bit concerning but there's not too much that can be done at the moment except to keep an eye on it. My next appointment with my surgeon is November 5th, and I will be having re-staging scans done late November/early December to see where to from here! We were given this life, because we are strong enough to live it. Thanks for sharing your story. Stay strong.